An interesting American article on how end-of-life care has developed in response to our experiences of death. Here are some aspects of that experience that the article talks about. [In the 1960s,]…[c]omplaints arose about a lack of choice on the part of patients, doctors indifferent to the pain and suffering of those in their care, and cold, impersonal deaths lacking all dignity in a cocoon of tubes and wires. [But still]…doctors, patients, and families drag their feet in acknowledging that death is on the way, and that is an important reason why so many of us personally know of, or have heard about, some miserable deaths where the dying went needlessly on. The idea of unlimited medical progress that admits of no upper boundaries is not turning out as hoped. We have not found, nor are we anywhere near finding, cures for the major killer diseases. What “progress” has given us is an enhanced ability to keep sick people alive at a high cost financially and a no less high cost in terms of pain and suffering at the end of life. We have traded off earlier, quicker deaths for later, drawn-out deaths. That bargain needs to be reconsidered. This is an interesting critique of the impersonality of some heroic medicine, and the need for low-tech, human caring. It comes round again to some of the concerns that have led to campaigns for assisted dying. The main point is that people do not want extended sickness leading up to their death. It is not that they want help to commit suicide: it is more that people want thoughtful healthcare decisions that recognise when death is approaching and allows it to happen naturally. Citation: Callahan, D. and Lawler, PO. A. (2012) Ethics and Health Care: Rethinking End-of-Life Care. Discussion Paper 4, Center for Policy Innovation. Washington DC: Heritage Foundation of America. (This is an American conservative think tank). Another in my series of pics from a cemetary in Bratislava, Slovakia. 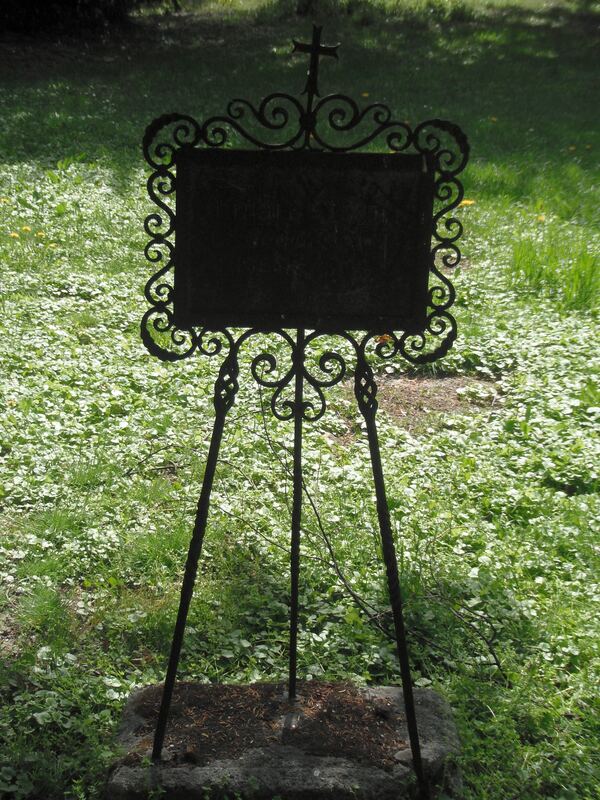 Here is a metal memorial, in the form, perhaps, of an artist’s easel: a picture of the embroidery your memories, in view of its ornate frame. I am taking part in an Internet Debate organised by SWSCMedia on social work and end-of-life care next Tuesday evening. I did not know what to expect, but it seems you can read a starting-off article on the topic on their website, called ‘Social work and end-of-life care: issues for debate’. At the time, you get loads of Tweets on the topic, and can contribute. I hope you join us. I’m planning to include pics from time to time in this blog, when I can find stuff about end-0f-life. I’m starting off with pics of memorials from different places. 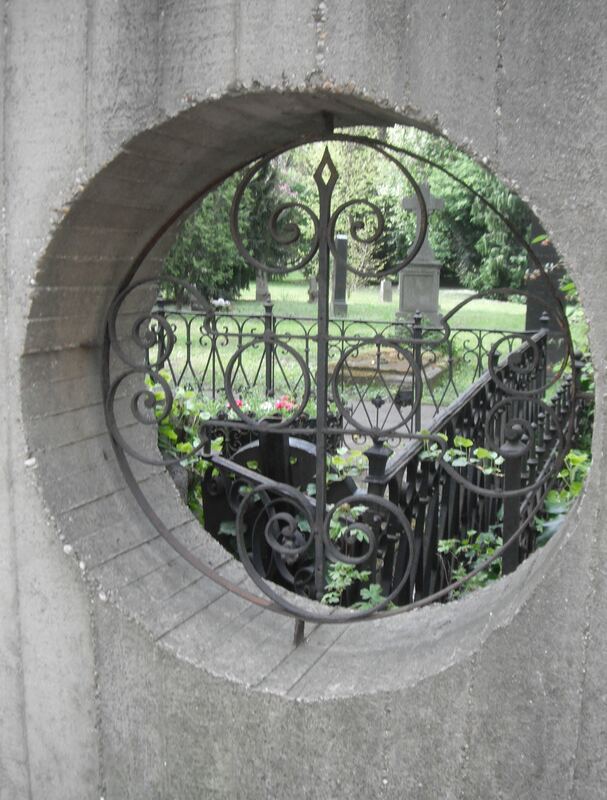 Over this week: pics from a cemetary in central Bratislava, Slovakia. Number 1 today: View through a porthole in the outer wall: looking in on people we want to remember. Should prisoners get better end-of-life care than non-offenders? But many people get poor care. Should prisoners get better care at the end of life than non-offenders, who cannot afford to have the care they want? 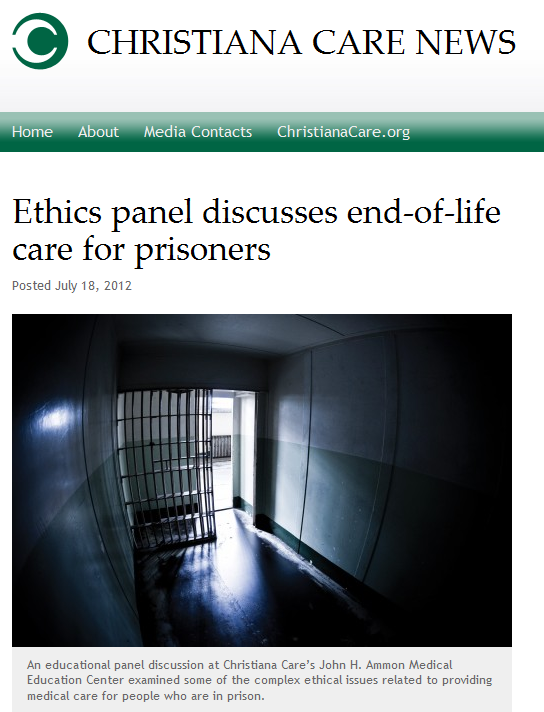 That is one of the ethical issues that palliative care professionals working in prisons face. Among the answers is the classic statement that that people are sentenced to prison as punishment not for punishment. In other words the loss of freedom is the punishment, not unreasonable conditions of life. The ethical argument is they should not get worse care than it is possible to give, because that makes the punishment harsher than intended. If that is true, the logical ethical argument is that social and healthcare should be the best possible for everyone. Is there anyone arguing for that? Or are we only getting the quality of care at the end-of-life that we can afford to pay for, or if we are lucky in the public services in our area? Link to the Christian ethical website that raises this issue. “Lawyers will say, ‘why don’t we do a living will and durable power of attorney? [lasting power of attorney in the UK]’’’ says Carr. “But people who draft wills are normally people who own homes and have assets to protect.’’ That’s less likely to be the case for poorer people and minorities, she said. 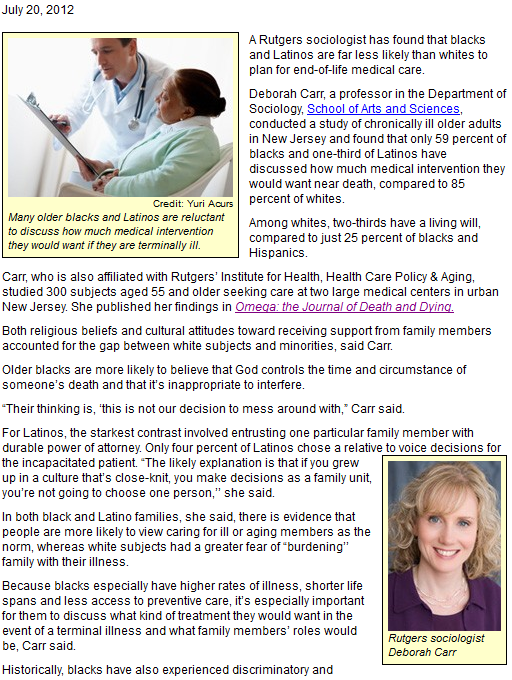 Carr believes it’s critical to raise awareness about end of life planning [especially among minority ethnic groups]. I wonder if we’re even thinking about that in the everyday practice or community work that social work practitioners are doing in the UK. 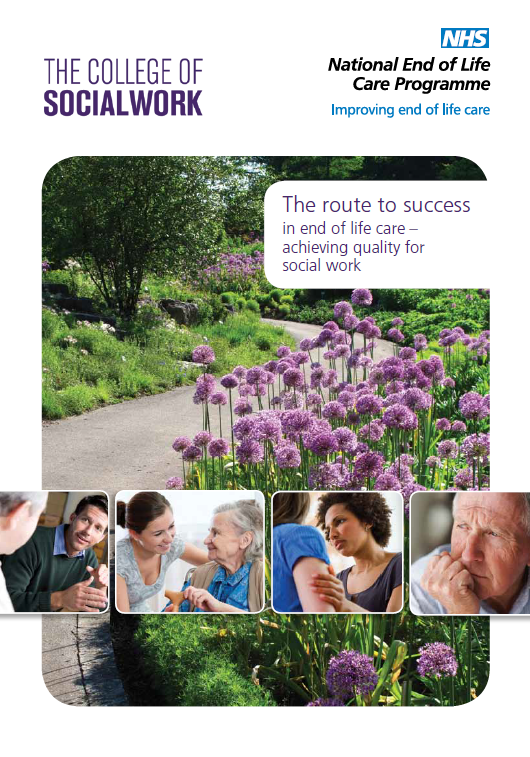 The National End-of-Life Care Programme has published its guidance on social work in end-of-life care, featuring some very glossy-looking social workers; perhaps the co-sponsor, the College of Social Work, is trying to improve the image that way too. It’s very comprehensive and a good text for students and for any of the post-qualifying courses that happen to include something on end-of-life care. As all of them should, but few of them will, because many adult social care departments will think that this is all too difficult and time-consuming for their form-fillers. I fancy that for people who are working for such departments, it will be too detailed a guide to picked up and used in a work setting, more’s the pity because I think everyone in adult social care should be developing and using skills in end of life care. One of the problems is that it follows the National EOL Care Programme’s ‘six steps’, which takes you through the whole process of working with someone at the end of life, whereas some quick practical guidance on how to talk over issues about dying and ways of dealing with the obvious questions that people ask might be more helpful. Link to the Guidance – you can download it from the Internet. There is lots of other guidance from the Route to Success scheme, including sheltered housing, prisons, homeless people and many others; get them and other National End-of-Life Care Programme documents by clicking here. Michael Wolff wrote about the illness and death of his mother in The Observer yesterday; the article has already appeared in a longer form in New York Magazine. The article covers a lot of ground, but it provides some useful pointers for others in the same position. However, it is based on American law and practice and does not fully apply to the situation in the UK. In particular,the assumptions about hospices passingly mentioned in the article do not reflect the position in the UK, where hospices are less long-term care institutions for people at the end-of-life, but shorter-term specialist provision. Once an older person starts to have serious episodes of ill-health, it’s important to think about what the future will hold and plan for a continuing deterioration in their condition. Once someone has severe dementia and has lost their ‘mental capacity’, doctors and other healthcare professionals will be obliged by their ethics to continue treating people when they fall ill. They will thus be keeping them alive even though the older person’s quality of life is not good. Unless you have what in the UK are called ‘lasting powers of attorney’ for making decisions on health and welfare matters, it will be hard for relatives to challenge the professionals’ decisions. Constant admissions to hospital are damaging but because healthcare professionals in the community do not want to have to cope with the responsibility of caring for people with very changeable conditions. or do not have the resources to do so, it is often what happens. Try to avoid it by employing, as this family did, a live-in carer around which family members can contribute what support and involvement they are able to offer. The lessons for service development are that we to help people plan as soon as possible in someone care career. We also need to train and support community and care home staff to avoid hospital admissions and we need to get much better at supporting people in their homes or in a suitable local setting, without imposing too much of a burden on their families. Link to the Observer article.